Imagine looking down tonight at your to-do list — and seeing every single item has been checked off. Sit up straight as you work. A new study from San Francisco State University found that when people consciously adopted an upright sitting posture as they worked through a series of math problems, they finished their work with mostly correct results. The researchers think this happens because slumping forward is a defensive posture that triggers negative memories of past failure — you'll start to feel pressured and defeated by your work as you do it. Good posture, on the other hand, subconsciously empowers you to believe you can cope with the job at hand, so you're more likely to finish it in a timely fashion and finish it well. Act out a task ahead of time. Ever arrive at a presentation you're giving, and realize you forgot an essential stack of papers back at your desk? Avoid delaying the completion of your important talk by actually miming the action of putting the papers in your briefcase before you actually put the papers there. It sounds funny, but by "acting out" an action you need to do more than once, your brain cements the action as a must-do, and you won't forget about it, according to surprising new research. Complete one job before starting the next one. A joint study from UCLA and Hong Kong University found that stopping one task to get another one rolling will only delay you from finishing both. This is because darting back and forth between goals you're trying to accomplish triggers the "overplanning" component in your brain — you start thinking about all of the obstacles facing you as you work on both jobs, feel overwhelmed, and slow down on your way to completing them. What's "pre-crastination"? Instead of procrastinating until the last minute, when you pre-crastinate, you use fresh energy to tackle the hardest job you have on your to-do list first. This is a good idea — until you expend too much valuable effort too quickly, according to researchers at Penn State University, who studied subjects who chose to physically carry heavy loads before tackling easier tasks. Their reasoning? The heavier buckets were closer to them initially, so they felt like grabbing the closest work at hand meant they could tick off a task right away. A good rule of thumb: yes, it's good to grab the first task you see on your desk and power through, but pace yourself. Refresh with a 10-minute break after each job you finish throughout your workday so that you get the tough stuff off your plate, but can still keep going without depleting your mojo. Try strolling around the office, chatting with a co-worker, or grabbing a healthy snack. 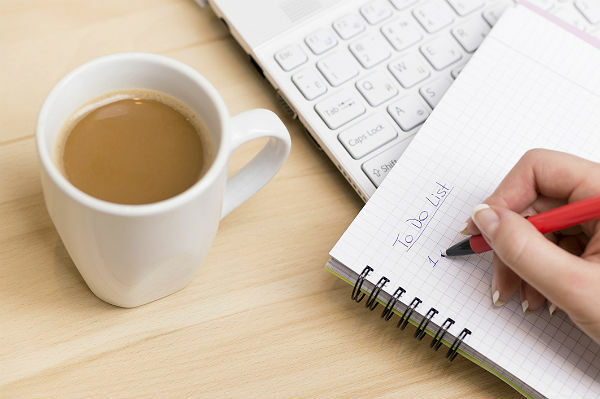 Imagine yourself tossing your completed to-do list away. A study from the University of Plymouth found that conjuring up a strong mental image of yourself performing a motor-oriented action you want to accomplish — like throwing away that finished list — will program your brain to more easily seek this action in real time, so you'll feel more motivated to get there. As you work through your list, keep repeating this image in your head — your day will go faster, your list will get shorter, and you'll feel great about making each goal happen!